Arya Pathik: Short Account of Pandit Lekhram "arya musafir"
To Speak of, write about, and believe in a thing as it is constitutes a truth. Our Aim is to further the advancement and advance the well being of mankind, to help all men in the ascertainment of what is right, and to enable them to accept truth and reject falsehood. in our opinion there is no other way to elevating the Human Race !!! Short Account of Pandit Lekhram "arya musafir"
Pt. Lekh Ram was born on 8th .of Chaitra 1915 in the village Saiyad Pur in the Jhelum district of Punjab. His parents were Sri. Tara Singh and Smt. Bhag Bhari. He was a police officer in Punjab and resigned from the government service voluntarily and devoted for propagation of Vedas even not caring for his family and only son too. He was influenced by the writings of Munshi Kanhaiya Lal Alakhdhari and came to know about Maharshi Dayanand Saraswati and Arya Samaj. He founded Arya Samaj at Peshawar (now in Pakisthan) and became a preacher of Punjab Arya Pratinidhi Sabha. He also vowed to write the authentilc life history of Maharshi Dayanand Saraswati. For this purpose, he travelled far and wide and collected a detailed account of the life of the founder of Arya Samaj. Pt. Lekh Ram wrote thirty three books. All his writings are in Urdu, but they have been translated in Hindi and some books have been translated into Sindhi and English also. He established the view points on Arya Samaj and vedic religion so forcefully that nobody dared to come forward to oppose. Many inspiring facts from his life are written in golden lines of Arya Samaj history. A small incident from his life is being quoted here. 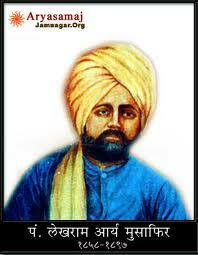 He was an ardent propagator for Vedic dharma and shuddi (re-conversion to Vedic religion) movement. One day he returned to home after day’s long propagatory work and was so tired. His wife told that their only son is very sick and if unable to take him to a doctor immediately, his life will be in danger. He understood the gravity of sickness of his son and promised to take him hospital after taking one Rotti as he was so hungry. When he was about to eat the Rotti, a post man carrying a telegram reached to him stating that few Hindus are about to change their religion to Islam in`Payal’ village in Patiala district of Punjab. Without thinking for a moment he left the meals and moved to the said village in a train. When he saw that there is no stoppage for train at the`Payal’ village, he jumped out of the running train and some how reached the venue of conversion with severe body injuries. He shouted `I am Pt. Lekharam from Arya Samaj is coming for Shasthrarth (religious debate) with you. If you defeat me in arguments, I myself along with these poor Hindus will embrace Islam. Otherwise you all should accept Vedic dharama. In the end of the shasthrarth all embraced Vedic Religion. This time one another telegram reached to him. The matter of it was his only son died of sickness! That was the dedication of Pt. Lekharam! Chief Aim of Writing This blog is to Unfold the Truth.. To Expound Truth as Truth and Error as Error.. The Exposition of Error in place of Truth and of Truth in place of Error does not Constitute the Unfolding of Truth !! !